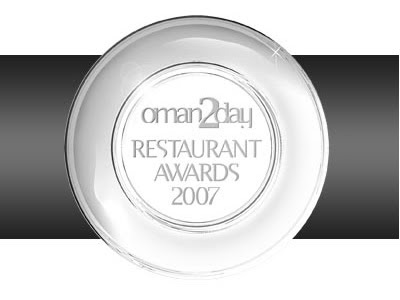 Oman2day is currently gathering votes for its restaurants awards for the year 2007, I do not how authentic these awards are, but the mere idea of having such a thing is really amazing. I was asked to fill in the voting form at a couple of places, but I was surprised by the greater number of place that did not ask to vote for them even though I saw piles of the voting form at the cashier’s desk. Is anybody else excited about these awards? Who will you be voting for? You can vote online for your favourite restaurants in Oman here.